I Heart My Glue Gun: A Winner! Hey everyone! Hope you all are enjoying your weekend! Congrats Lacey! 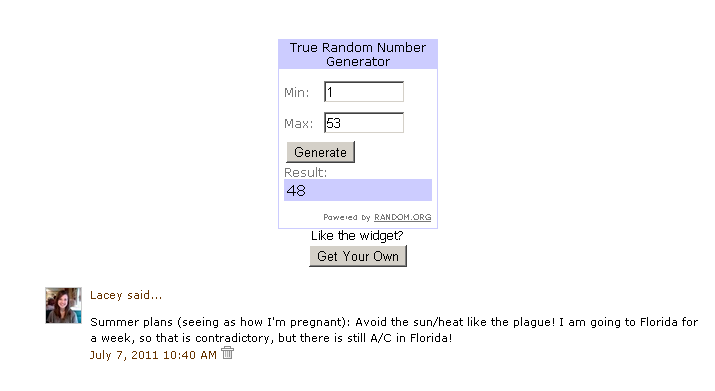 Please contact me within 48 hours to claim your prize! I enjoyed reading EVERYONE'S summer plans, you guys have some seriously awesome stuff planned! As for us, we're going to Las Vegas in 9 days! We're taking the kids to Circus Circus and we're gonna let them have at it! Should be EXTREMELY tiring....but hopefully fun. Congrats to the Lacey! Sounds like ya'll are definitely gonna have a blast! Hope you're having a great weekend. I just hopped over from Meet Me Monday! I look forward to joining in your community and I am now your newest follower.